It also notes that you can filter 400 gallons (1800 litres) of water using this product. 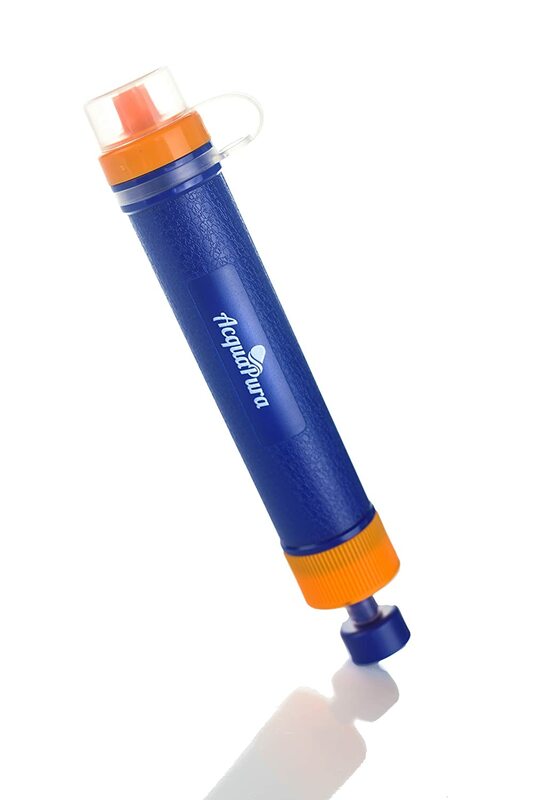 This got me interested, it’s small, it’s light, you can use it to drink water from a river – it sounds perfect for long distance running in remote locations. There are often times when I don’t want to carry large quantities of water with me and this could be a solution. I did a little research and then bought this because it has triple layer filtering (which is apparently what I need). So – how do you actually use it? You just put a ‘pre-filter’ on the end (which are included) and then screw it onto a bottle. It fits standard bottle tops (think a normal coke bottle) and you tip your bottle up and drink. From the tap it seems to work – the water tastes fresh (I think I can tell that it’s ‘cleaner’ but it could just be in my head). So – the next step is to take the plunge into a river. I was really nervous about this. I took it down to the river severn in my pocket, although I still had to carry my bottle (it really is that small, although I guess I have deep side pockets, it probably wouldn’t fit into a running belt pocket). Now, this river looks basically like mud. I stopped running, scooped up some water into the bottle, applied the pre-filter, screwed it on and took a drink. I’d love to say that it tasted just like it did from my tap, but it really didn’t. It tasted kind of disgusting. I drank may be 100ml (at a guess). I put it away and started to run again (I had planned on trying to run and drink, but I just didn’t want to). I started burping and feeling a bit sick. I think this is just psychological, but it is hard to say. I was pretty worried about this actually and expected to be ill for weeks. However, once I’d run a bit more I felt fine and then the next day I felt fine. So – I guess it didn’t do me any actual damage and hopefully that is because it filtered the bad stuff out of the water. In future I’m not sure I’d use this unless I needed to, but I will pack it and perhaps not take my ‘extra’ water if I’m doing long hikes or multi day events where you have to carry all your supplies. It really would give me enough peace of mind to shave some weight off my water carrying for ultra marathons and long trail runs (as long as you know there are water sources). So really, you’ve got to say that this is (hopefully) doing what it should. It’s just hard to put your faith into something like this when you can’t really see what it’s doing and you just have to take the manufacturers word for it that they haven’t built this individually unit incorrectly!